The IBM Smarter Workforce Institute (SWI) recently released a report showing the importance of using multiple channels for recognition. The report is based on a survey of 19,000 workers from over 26 countries, and it shows that the more communication channels we use to recognize workers, the better we can reach and thank employees. 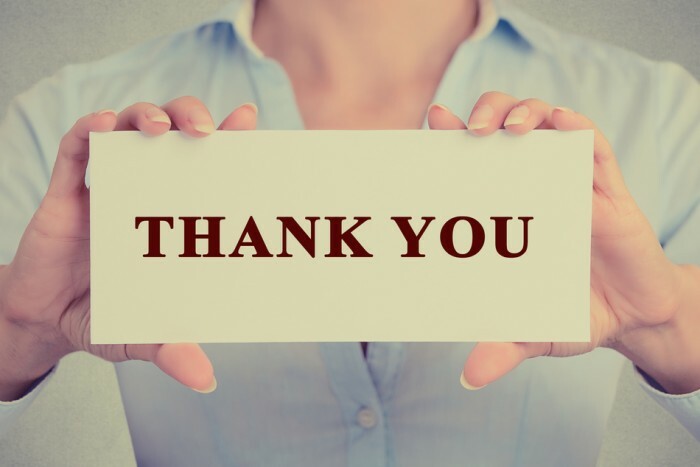 This thanks leads to higher engagement and retention. Employees who receive recognition are more likely to be engaged at work. The engagement level of employees who receive recognition is almost three times higher (76 percent) than the engagement level of those who do not (28 percent). Workers who receive recognition are less likely to quit. Without recognition, about half (51 percent) of surveyed employees say they intend to leave, with recognition just one quarter (25 percent) say they intend to leave their organizations. Employees whose organizations use multiple communication channels for recognition are more likely to feel appreciated and show a higher level of employee engagement. 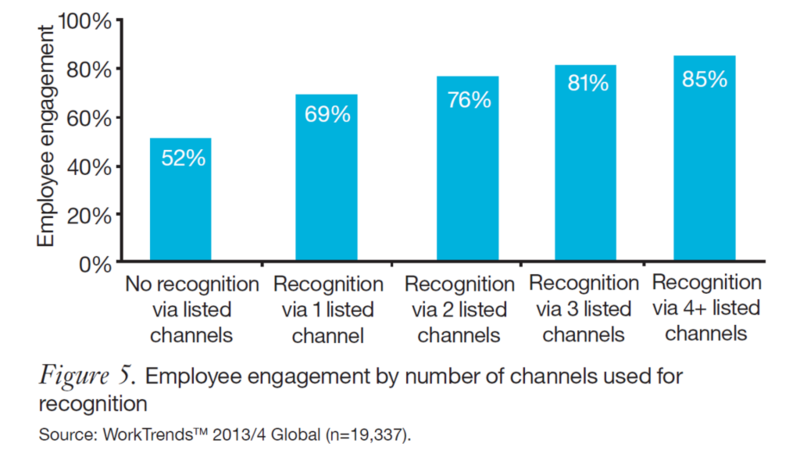 The more channels used for recognition, the higher the employee engagement level. The findings imply that technologies such as social and mobile could be strong candidates for the effective delivery of recognition as they offer interactive, frequent and immediate communication via multiple channels. Written and face-to-face recognition were historically the primary methods to thank workers. These channels are not enough to reach employees in today’s global, virtual and mobile workplace. Use of technologies like mobile recognition, online recognition platforms, peer-to-peer recognition videos are critical to keeping high employee engagement levels. Timely recognition is essential for recognition effectiveness. Mobile apps and other technologies make this far more feasible more than having to wait to get into the office and submit paperwork or logging in through a computer. Though we know speed and timeliness of recognition matters, email unfortunately continues to dominate (at 58 percent) as the most common form of technology used for recognition. But email is highly flawed when used as the sole means of “technology-based recognition.” It does not share the accomplishment of the employee with peers or provide a way to easily track and report on recognition activity in any kind of deep or meaningful way. Truly effective methods are driven by social recognition, involving work communities, online platforms, and mobile apps that share recognized accomplishments with colleagues and work friends to enable a flurry of congratulations on a job well done. Recognition is a direct, key driver of employee engagement. IBM’s Smarter Workforce Institute’s research showed employees who receive recognition are 48 percent more engaged than those who do not. It also showed that the more channels used for recognition, the higher the employee engagement. Social recognition is key not only to employee engagement, but also to retention. Retention is in the top three challenges facing human resources today. When looking at the link between recognition and retention, half (51 percent) of workers who did not receive recognition intended to quit versus only 25 percent of those who received recognition. I couldn’t agree more. What recognition channels are you using to recognize your workers? Are you using enough channels? Are you using the right channels? You can find more from Derek Irvine on his Recognize This! blog. Derek Irvine is one of the world’s foremost experts on employee recognition and engagement, helping business leaders set a higher vision and ambition for their company culture. As the Vice President of Client Strategy and Consulting at Globoforce, Derek helps clients — including some of world’s most admired companies such as Proctor and Gamble, Intuit, KPMG, and Thomson Reuters — leverage recognition strategies and best practices to better manage company culture, elevate employee engagement, increase retention, and improve the bottom line. He's also a renowned speaker and co-author of Winning with a Culture of Recognition. Contact him at irvine@globoforce.com.